The Tinkerer is a Marvel villain known for his near superhuman ability to construct powerful gadgets from electronic scraps. The Tinkerer is one of Spider-Man's oldest villains and has appeared in countless stories since then. Actor Michael Chernus will play the Tinkerer in the film Spider-Man: Homecoming. Phineas Mason runs a what appears to be a simple repair shop but is actually an underground weapons supplier to the criminal underworld. Customers come into the repair shop and provide a transistor radio and say, "I've got a radio that just won't carry a tune". When this que is given the criminal is allowed into the true Tinkerer shop. 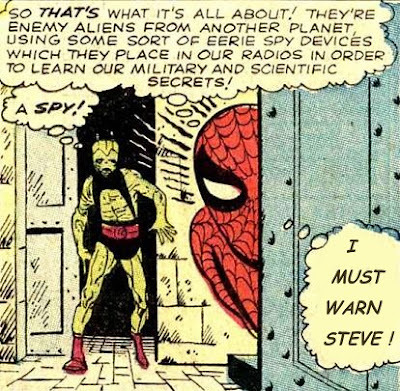 The Tinkerer first ran across Spider-Man in a bid to black mail and control politicians. He set out various henchmen armed with his gadgets to place bugs. As he escaped due to the intervention of Spider-Man he left a bizarre alien mask and also used a flying saucer escape vehicle. These elements he added to make it appear that he was infact an alien and throw off the authorities. The super villain Mysterio worked as one of the Tinkerer's henchmen and later took one of the Tinkerer's alien suits to use for his own criminal career. His next scheme involved using an advanced automaton named "Toy". The Tinkere would go on to design the Scorpion's tail, Rocketracer's skateboard, Bigwheel. He as done work for the Vulture, Goldbug, Constrictor, Diamondback, Whirlwind, Hammerhead, the Beetle, the Black Cat, Stilt Man, Cyber, Hypno Hustler, Jack O'Lantern, Killer Shrike, the Owl, the Grizzly, the Ant-Men and the first Jester. The Tinkerer helps rebuild the SpideyMobile but also sabotages it leading to another confrontation with Spider-Man. The Tinker has a son Rick Mason who is a super spy who goes by the name of Agent. The Tinkerer aides his son on various cases despite being on the other side of the law. When his son is killed a grief striken Tinkerer for a time reforms his ways. The Tinker's son has since been revealed to be alive but in deep cover. In the Secret War story line the Tinkerer's technology is shown to have origins and financing going back to Latveria and Doctor Doom. The Tinkerer's beloved grandson is killed in the Stamford Connecticut event that leads the Marvel Universe toward Civil War. Shortly after a grief stricken and suicidal Tinkerer runs into the Punisher whom the Tinkerer begs for death. The Punisher stabs the Tinkerer in his back effectively paralyzing him but leaving him alive. The Tinker then works in a wheelchair where he helps Cyber a Wolverine foe. Things go baddly here. He also helps the Fantastic Four children out of a bind in Secret Wars. The Tinkerer helped the Hobgoblin gain some advanced technology to take on the Superior Spider-Man however his new apprentice Tiberus Stone tampered with the tech causing it to fail. It is not clear if Tinkerer's abilities are a true superpower or simply a unique skill aided by his high intellect. That said he is an amazing ability to build super powered weapons and items from almost nothing that rivals the likes of Super Powered engineers such as the X-Man, Forge. In addition to his ability to build weapons the Tinkerer also has vast scientific knowledge that he could put toward solving problems. The Tinkerer will be one of three villains in Spider-Man: Homecoming. Actor Michael Chernus will play the Tinkerer in the film Spider-Man: Homecoming. Michael Chernus has been in a variety of major movies and TV series including: Bourne Legacy, Orange is the new Black, Captain Phillips, and Aloha. It seems likely that the Tinkerer will be team up with some of the other villains to help build them gadgets to defeat Spider-Man. An image of Michael Chernus's Tinkerer standing next to Michael Keaton's Vulture.